Islamabad Word is spreading like wild fire among the youth in Pakistan about a new urban art form called parkour and to everyone’s surprise there are no official classes to teach this art in the country. Also known as free running, parkour is a physical discipline which combines acrobatic moves around objects involving flips, jumps, rolls and vaults. The rise of social networking sites ouTube and Facebook — have helped fuel this new phenomenon on the streets — from Islamabad to Karachi. Abdullah Ahmad Khan (aka Sanki King) likes to think of himself as the pioneer of the parkour scene in Karachi. Sanki started training six years ago after watching a parkour video on YouTube. The 21-year-old fine arts student was instantly hooked to this unique form of art and it didn’t take long for him to start jumping from walls and flipping over objects in the proximity. “When I do parkour, whatever I touch or step on, I leave my mark on it and that feeling makes me want to touch higher spaces and jump off taller heights and go across the farthest gaps “ said Sanki. Parkour enthusiasts are often referred to as “traceurs” in street lingo and in Sanki’s case, people refer to him as a man performing “monkey tricks”. Like many other young people in Pakistan, Sanki is part of a growing generation looking for changes from persistent power shortages, rising poverty and never-ending political feuds. With 63 per cent of the population under the age of 24, Pakistan’s next generation is truly changing the script as Internet and mobile phones are fast taking over as primary means of communication. “Before the latest technology came along, there was no way people with common interests could engage with each other even in the same city, while connecting with foreigners was an alien thing,” Sanki said. “Now, every other person has an email or Facebook account. My generation has friends abroad and knows countless things about other countries and culture,” he said. Sanki communicates with fellow parkour practitioners through his Facebook group ‘Parkour in Pakistan’. There, traceurs are able to exchange tips, post videos and discuss their progress. Free running has originated from France and the art has been used in countless Hollywood films and music videos, most notably in the opening sequence of the James Bond flick, ‘Casino Royale’, and also in ‘The Bourne Identity’. Bollywood actor Aamir Khan has also reportedly mastered parkour moves for his role in the upcoming action movie Dhoom 3. Like Sanki, Abraham Dean from Islamabad never had any formal parkour training and yet he is now one of the best traceurs in the country. The 23-year-old, nicknamed Aboo Dean, was born in a small Christian community in Taxila, close to Islamabad. From a very young age, Aboo was fascinated by acrobatics. “It all really started when YouTube became popular and I stumbled upon these guys just jumping around from point A to point B in an urban environment,” Aboo said. “I was so amazed by the fact that there were people like me doing this and helping each other by sharing the videos and so I started it myself,” he added. Although Aboo does not have access to a gymnasium to fine-tune the art, he trains in his locality by using his mattress as a cushion to avoid any physical damage. Injuries are common as traceurs don’t use any safety or equipment. Aboo is hopeful that there will be more facilities to accommodate parkour enthusiasts as the trend is gaining popularity every day. “The younger generation here think it’s really cool and appreciate it - some even practise parkour with me, which makes me happy. There is no other motive behind it so in a way I am trying to express myself, or at least challenge myself,” he said. 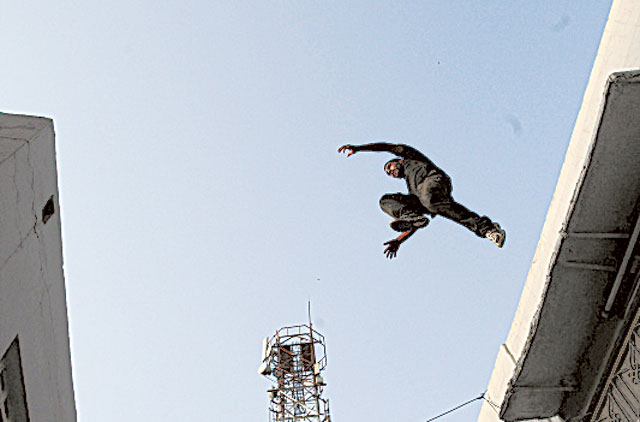 For the young people of Pakistan, parkour is more than a hobby or exercise. Whether be it a form of expression or releasing pressure – it is a way of life. - The author is a freelance journalist based in Islamabad.